Avid golfers from all over the world come here to play our unique, public and semi-private Cape Cod golf courses. Whether you're coming for that long-awaited "golf 'til you drop" getaway with your buddies, or just interested in a few hours on an awesome seaside course - you'll find just what you're looking for in my Cape Cod MA golf course directory. Note: At most courses, greens fees vary by time of year, day of the week, and tee time. Additional charges apply for golf carts, club rentals, and taxes. Be sure to call or check the course's website for current greens fees and any discounts that may apply. PHGC is an 18 hole, 3585 yard, par 60 executive course established by former PGA professional Paul Harney and still owned and operated by the Harney family. It's a fun and friendly course to play! This 2490-yard course has 9 holes (eight 3's and a 4), and a laid-back playing atmosphere. Consistent breezes off Nantucket Sound during the summer, along with a laid-back playing atmosphere, make this an enjoyable course for all ages and playing abilities. The 9-hole Harwich Port course features 2,461 yards of golf, par 34. This course has been around since 1920, and its converted barn clubhouse reflects its heritage well. Built in 1895, Chatham Seaside Links was originally part of the elegant Chatham Bars Inn resort. It's been recently taken over (and the course significantly improved!) by the town of Chatham. The Links features 9 holes at 2890 yards in a pretty setting near downtown Chatham. One of this Cape Cod golf course's claims to fame is having been named by Golf Digest as one of the "Best Places to Play". Holly Ridge offers 18 holes of par 54 golf on over 3000 yards, on a challenging yet fun course designed by Geoffrey Cornish. At Falmouth Country Club, you'll have your choice of an 18 hole, 6665 yard, par 72 championship course - or their 9 hole "Talon" course. The terrain here is relatively flat, making it a great course to walk and enjoy the scenery. Cape Cod Country Club is in the quaint Falmouth village of Hatchville. Its 18 hole, par 71, 6429 yard course is in a links type layout and features a variety of playing terrain along with scenic water views of Coonamessett Pond. Quashnet Valley's 6601 yard, par 72 championship layout is set along cranberry bogs, freshwater ponds, and the Quashnet River, and provides a challenging golf outing for players of all abilities. Conveniently located near downtown Hyannis, Twin Brooks is a favorite among Cape Cod golf courses for local golfers and visitors alike. With 18 holes, 2621 yards, this course is considered one of Geoffrey Cornish's "greatest Par 3 masterpieces". Blue Rock has long been one of the most popular Cape Cod "stay and play" golf resorts. Scratch golfers will find challenges on Blue Rock's 18 hole, par 54, 2890 yard course - but it's also friendly to weekenders and juniors, as well. Overlooking the beautiful Bass River, this course features 6665 yards of par 72 golf on 18 challenging holes. The fairways are narrow, the greens are small, and the views are spectacular! CY&CC is a semi-private country club in the historic town of Wellfleet. The club's 9-hole golf course has wonderful views of the Bay, and offers two sets of tees for those who'd like to play one of the smaller Cape Cod golf courses but still get in a full 18. This is without a doubt one of the prettiest courses you'll find anywhere, set on the bluffs overlooking the Atlantic Ocean. Highland Links is aptly named, as it's a real Scottish-style links course with deep natural rough, Scotch broom, heath, non-irrigated open fairways, and Highland Light as the backdrop. This 18-hole, par 70, 6300 yard golf course mixes it up with a good variation of holes - uphill and down, long and short, and narrow and wide fairways. When you're done for the day, relax and watch the sunset over the Bay from the clubhouse terrace! Sandwich Hollows is a town-owned and operated 18-hole, par 71, 6307 yard course. One of many unique features of Sandwich Hollows is its grass tee practice range. Another great feature is their year-round special - all day Wednesday and every day after 1 p.m., only $29.95 per person with a cart included. If you're looking for challenging Cape Cod golf courses, try Ballymeade. This well-maintained 6928 yard, par 72 course with its spectacular fairways and greens, will definitely test your skills - and perhaps your sense of humor, too, unless you can hit 'em long and straight. When you get to the 11th tee, take a few extra seconds to soak in the breathtaking views of Buzzard's Bay! The fairways at HGC are nice and wide, the course and facilities are well-maintained, and many claim that Hyannis Golf Club has some of the best greens of any public course in the area. 18 holes, par 71, 6711 yards. Olde Barnstable Fairgrounds invites the public to "Come play where the pros play!". This 18-hole, par 71, 6479-yard course can make that boast, having hosted a number of prestigeous events including US Amatuer and US Open qualifiers. The Town of Yarmouth has two top-notch public courses: Bayberry Hills, with 18 holes (par 72, 6724 yards), as well as a 9-hole links course called "The Links 9". The big course is quite popular, so if you can't get your desired tee time there - consider trying the links course. With its tall sea grasses, strategically placed bunkers and sometimes hearty breezes to contend with, it's a whole different world. One of two town-owned and operated Cape Cod golf courses in Dennis. The Highlands is a par 71 championship course with 6,500 yards of play across rolling terrain. 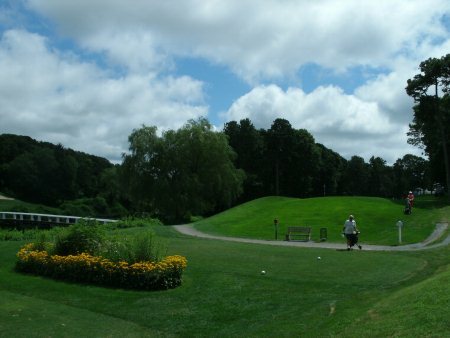 Many golfers consider the Highlands to be the easier of the two Dennis MA public golf courses because, although still quite challenging, it's a bit more open than The Pines. With 18 holes of par 72 golf on 7029 yards from the longest tee, this course has some long, challenging holes - especially on the front nine. Accuracy is key on the tree-lined fairways! Cranberry Valley is one of the more traditional Cape Cod golf courses, running alongside cranberry bogs, marshes and pine woodlands. This par-72 course has a yardage of 6745 over 18 holes (some challenging, others not so much!). Cranberry Valley is popular and centrally located, so it does tend to play a little slow, particularly on weekends. There are two courses at The Captains - the Port and the Starboard, designed by renowned architect Brian Silva. Both are par 72 and just over 6700 yards. The Captains rank right up there with the best championship courses, getting glowing reviews from such prestigeous publications as Golf Digest and Sports Illustrated. Photo Credit: Many thanks to Flickr member CapeCawder for sharing the amazing photo of Highland Links in the fog.